Using Google Adwords for the first time can be daunting. But you have your $75 credit and don’t want to waste it. (If you don't have a credit, check the following magazines: Wired, Fast Company, Entrepreneur, or any other business or tech magazine.) But don't be scared! Follow the “How To” below for a beginner’s setup of Google Adwords. To understand the hierarchy of an Adwords account, see here. This will help you understand how everything works together. Rather than reinventing the wheel, use the following tutorial for initial setup. Read notes below as you go through this tutorial for more customized instructions for your Etsy shop. Sign up for & set up a Google AdWords account from Stefan Klinke on Vimeo. 1. Creating Your Account: If you are using Google Analytics, click “I have an account” at setup and use your Google Analytics account log-in info. If you do not, select the second option. 2. Time Zone & Currency: Make sure to select the correct time zone and currency as you cannot go back and correct these later! c. Networks: Be sure to have your ads showing only to the Google Search Network & Search Partners, NOT the Display Network. d. Devices: Set to all devices. f. Budget: Based on your estimated CPC (which we will get to later), figure out how much you want to spend per day. (This can be edited later.) For a jewelry shop and a $75 Adwords credit, I would set to $10/day. This will get you about 7 days of ads. To get more traffic per day, set budget to $20. Keep in mind this only gets you 2-3 days. g. Advanced Settings-->Schedule: Set an end date based on the estimated time your credit will run out. This will keep you from unexpectedly paying out of pocket if you forget to pause your campaign in 7 days. This can always be extended later. e. Destination URL: The page on Etsy you want your visitors to go to. It can be your main shop page, a specific section in your shop (e.g “Rings”), or your profile page. You decide, based on your ad and keywords, where people are most likely to buy. Use the following screen shot to understand navigating the dashboard. Click image to make bigger. a. Go to “Reporting & Tools”-->”Keyword Tool” in the top navigation. b. Put in keywords describing your products. This can be “jewelry”, “pottery”, or the like. c. Press “Search” to get a keyword list. d. Put a check in the box next to the keywords you want. Keep in mind that the more competitive a keyword is, the more expensive it will be per click. e. In the bottom side bard, for match type, check “Phrase” and uncheck everything else. This will spend a small budget wisely. f. Click “Add Keywords”. A box will pop-up. Select Campaign#1, Ad group#1, and “Save and Continue”. g. You now have keywords! You want to group your keywords to be as specific as possible. So if you knit, you’d want a separate ad group for hats, mittens, fingerless gloves, scarves, etc. This will allow you to write more specific ads and appeal to exactly what a user is searching for. You can have up to 2,ooo ad groups in a campaign so don’t be shy about building out. For the sake of time and a limited budget, I’d build out ad groups for the keywords and items that sell the best for you. Should Adwords do well, then you would continue building out. 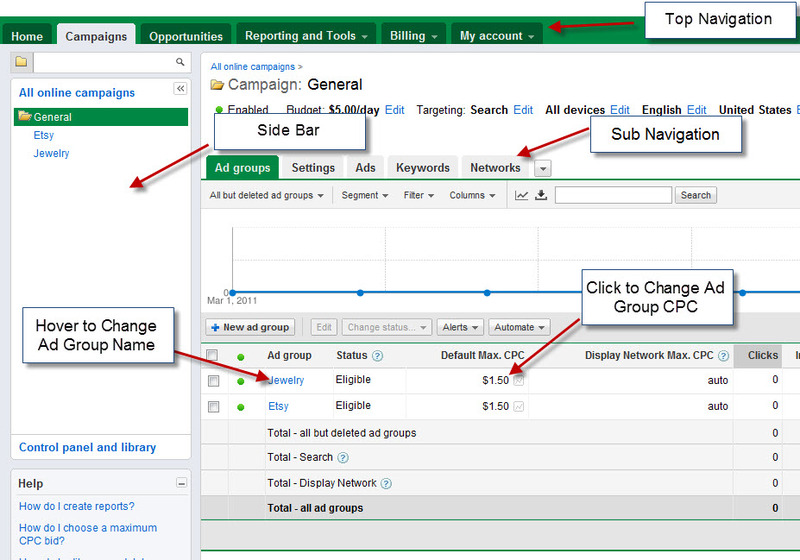 To add new ad groups, click “Create a new campaign” from the sidebar when on the “Campaigns” top nav tab . Then click “New ad group”. It will be the first option in the main body of the page. Name it. Create an ad. Then follow the same steps for adding keywords. To change the name of an ad group, hover over the ad group name in the “Ad group” sub navigation and click the pencil. See image above. A box will open up to change the name. Then save. a. Go To “Reporting & Tools”-->”Traffic Estimator” in the top nav and enter a few of your keywords, your max CPC (try $1 to start), and your daily budget. b. Under “Summary” in the sidebar you will see a CPC range. Pick a CPC in that range that you’re comfortable with. Go low first. c. Go to “Campaigns” top nav and ”Ad groups” sub nav. Click on your default max CPC. (Click the actual CPC, not the heading. See image above.) A box will open up where you can set a CPC. Use the CPC you chose in the step above. This will set a CPC for all your keywords in the ad group. a. Go to “Billing”-->”Preferences” top nav. Once on the page click “Postpay Billing”. Enter a CC and bank account number. b. At the bottom, enter your promo code exactly as it is written, including dashes. c. Press ”Redeem”. You should get a confirmation that the code worked. 8. Make sure all campaigns, ad groups, keywords, and ads have a green circle and say "Eligible" next to them. This means they are on and ready to go! 9. You’ve now fully set-up your PPC account. Ads should begin running immediately. Note: They may not show immediately on holidays or over weekends. TIP: To see where your ads are showing, use the Ad Preview Tool Under “Reporting & Tools”. Keep in mind, though, that with a limited budget, your ad won’t show for every search and thus, this tool may not show it every time either. As long as your account is accruing impressions, your ads are on. Also, do not click on yours ads from a normal Google search. This will cost you money! Let your ad groups and keywords run for a days or so. If you’re spending too quickly or not enough, adjust your CPC. Use small increments of 5 to 10 cents when adjusting. You’d be surprised how big of a difference that can make! And be sure you have Google Analytics setup to track Adwords traffic! See here for that tutorial. Feel free to ask questions in the comments section. I check email often! Like what you read? Subscribe for more useful tips and tricks! Google Adwords told me on the phone when I tried to redeem my $100 dollar coupon they sent me that it was against their policies to sell me advertising because I was with Etsy and they do not work with Etsy! Are they just trying to prevent me from using my coupon or is there something to this! I have never heard of that. Nor have I had problems using Etsy as my destination pages for PPC ads. Did you try redeeming your code by entering it into the code box on the billing page? Calling Google doesn't always yield the best results. hi- great post. Thanks for writing it, it really helped me. You have some really good posts on here for etsy users. Thanks so much!